So I have already shared a few US drugstore disappointments from my trip to the States and today it's time to share some of the drugstore delights I have discovered so far! L'Oreal had some great bits-first up is the L'Oreal Magic Lumi light infusing primer. This is my absolute favourite from all the things I bought and I have developed an obsession. This is a pearlised white liquid primer that adds an amazing glow to the skin. It's very very similar to MAC Strobe Liquid but not as 'on speed' as the Strobe Liquid. It's lightweight and can be used as a primer, mixed with foundation or as a spot highlighter. Foundation sits really well over it and it makes me feel like I look awake and glowy. I bought 4. In terms of glow I would say MAC Strobe cream is the most glowy, then this and then something like the Chanel Sheer Illuminating Base is the most subtle of this type of product. Also from L'Oreal is the Magic Lumi Highlighter in Light. It's a twist up pen concealer that gives YSL Touche Eclat a run for it's money. It's really good for highlighting under the eye and disguising dark circles. It blends easily and doesn't crease. Finally from L'Oreal is a new release that I don't think is available yet in the UK or Dubai. The Le Matte lip crayons are really good matte lip products. They're long lasting and non drying and really pigmented. I picked up Matte-r of fact and Mad for matte and love both. A couple of downsides-personally I find the tip of the crayon quite difficult to control and I recommend using a lip liner first and then for really precise application, a lip brush dipped into the crayon to apply. Secondly, Walgreens stuck a very sticky sticker on the lid of the crayon which is a nightmare to get off and leaves the pen sticky and dirty. Little things like that can really put me off using a product. The Essie Gel Setter top coat is brilliant for extending the life of my manicure. It adds a really glossy finish to nails and since using it I haven't had one chip. Last up are the Milani Bella Eyes Gel Powder eyeshadows. I bought the shades Bella Bronze and Bella Sand. The first time I used them I wasn't very impressed, feeling they were a bit dry in texture. But since I have gotten back to Dubai I have been using them a lot and really like them. 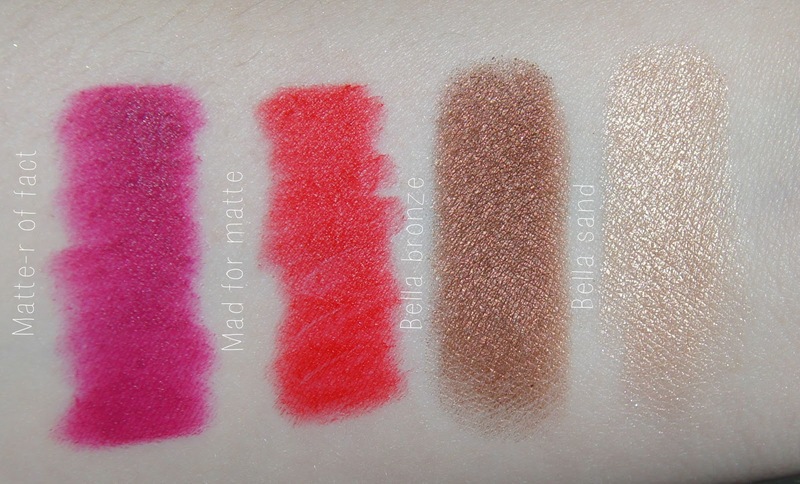 They literally last all day, there is very little fallout and the pigmentation is excellent. Bella Bronze is such a stunning reddy brown colour with complex microshimmer embedded into it too. I'm loving this type of shade at the moment. Have you tried any of these drugstore delights?